A factory reset in iTunes will fix a lot of iPhone problems, including battery drain and general sluggishness. However, you may not want to lose your text messages, which will happen when you reset your iPhone. 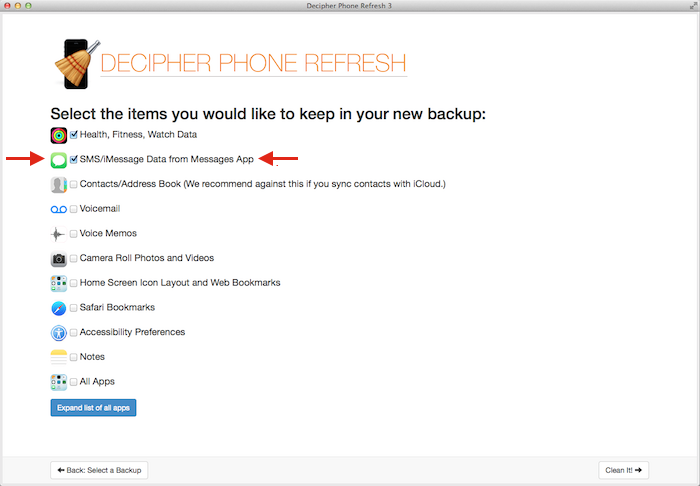 Download Decipher Phone Refresh, install, and run it. In Decipher Phone Refresh, select your backup you just made in iTunes. Click “Clean It!” to create the new backup. Follow along with the program until it tells you it is time to restore the backup. Open iTunes and press “Restore Backup” to restore a backup. Select the backup named starting “Decipher Cleaned” which is the new trimmed-down backup. After the restore, when setting up your iPhone, select “Setup as New” when asked if you want to setup as new or restore from a backup. That's it, you should have a fully wiped iPhone, except WITH your text and iMessages intact! Instead of trying to wipe your iPhone but keep your messages on the device, you could choose to export your SMS and iMessages to a computer, and then totally wipe the iPhone. This can be a good option if you're resetting your iPhone because it's out of space, and a lot of that space is taken up by your text messages. You can use our software Decipher TextMessage to save your text messages to your computer. Simply by downloading Decipher TextMessage and running it, Decipher TextMessage picks up your new text message data out of your iPhone backups made in iTunes, and adds it to a running history of your messages. When you need to copy more text messages from iPhone to computer, make a new backup of your iPhone in iTunes, and run Decipher TextMessage to save the new messages.